When going out salsa dancing in NY, you’ll occasionally get the following question: “So, what type of salsa club are we going to?” Though one salsa club is the same as any other salsa club for most people, there’s a delineation in NY between clubs/socials that have “trained” dancers, and those who’ve primarily learned in the “street”. I know this is an over-simplified description, but one type of club, along with its attendees tends to focus more on the dance, while the other is primarily focused on the music. Although I spend most of my time in dancer-centric clubs, at times, I find that I need to hit up a club featuring a great live band, as there’s simply no better way to connect with the music. Well, one of the little gems in the City that has made great efforts to consistently provide live-salsa can be found in Spanish Harlem on East 108th Street. 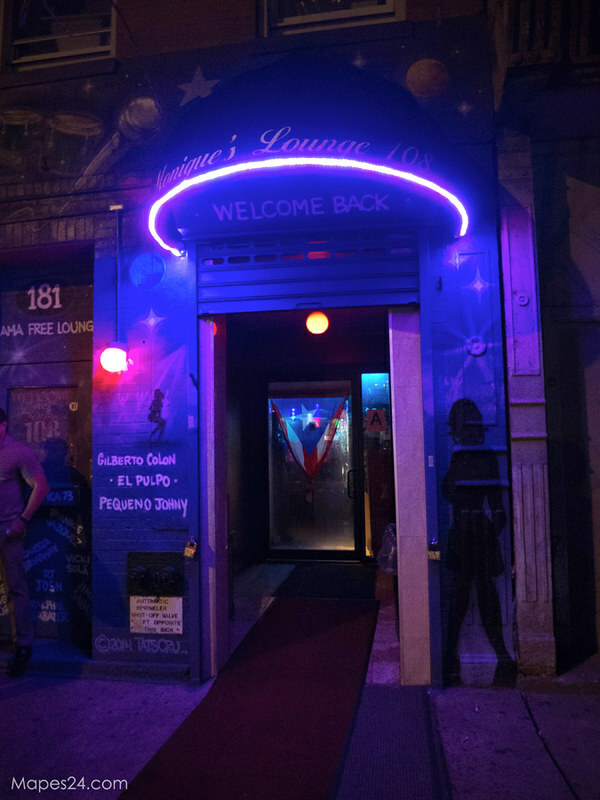 Monique’s Lounge 108 is a small bar/lounge that has been providing locals the opportunity to listen, and dance to some of the great NY salseros at their ‘Salsa Saturday’ events. Although located on a quiet street, the entrance to Monique’s is definitely hard to miss! After having been a part of the dance scene in NY for a few years, I’ve come to realize that a dance performance needs to been seen in person in order to be truly appreciated, and to capture all the intricacies and moments that are lost when just watching it on Youtube. This definitely holds true to salsa music as well. Although I’ve come to prefer dancing to bachata over the years, I definitely maintain my deep admiration for the amazing musicianship that is on display during a live salsa show. There is something about the harmonization of the congas, timbales, bongo, horns, bass, piano and vocals that is guaranteed to get my adrenaline pumping. For anyone who’s seen Frankie Vasquez perform live, I’m sure they’ll agree that he makes it virtually impossible for you to stay in your seat! As his passion for the music simply cannot be captured on video, I highly recommend that you check him out live, as a Frankie Vasquez set is something that everyone should treat themselves to experiencing in person! Since Monique’s is a smaller lounge, the audience is able to get up close, next to the action, and really appreciate the amazing musicianship that’s happening on stage. Julieta and Marcelo with Frankie. Me and Ivonne getting our photo-ops with the man himself! 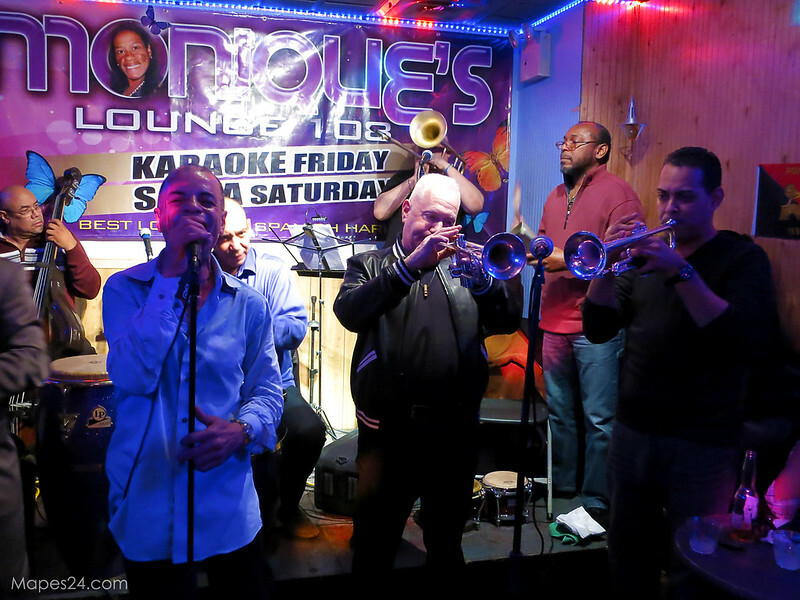 So for anyone who has any interest in listening to great, live salsa music and dancing along with people who are obviously quite passionate about the music, definitely make sure to check out Salsa Saturdays at Monique’s Lounge 108 for a uniquely NY salsa experience. Previous: Previous post: How I Quenched my Foodie and Photo Cravings Along the Malecon in Panama City (Panama).